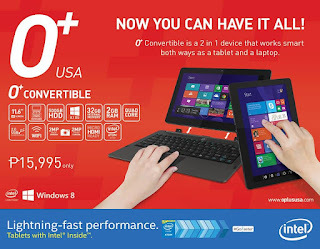 This may not be too late to post, O+ reaches another level of device they offer from smartphones and tablets now here comes 2 in 1 laptop that works as a computer and tablet. O+ Convertible is a multi platform device that runs on Windows 8.1 operating system powered with quad core Intel Atom processor. You can use it as laptop by docking its keyboard and detaching it if you prefer handy tablet mode. It also lets you install Windows applications that you can use in business related work just like what you can do on your regular designed laptop and desktop. If you’re interested with this device you can check out the specifications provided below for your reference. In terms of price O+ Convertible doesn’t let you down, for only 15,995 pesos you can own this multi mode device. As usual package you can also get a headset, charger and manual of this device inside the box.